The saga of drama continues for the New York Knicks as NBA Commissioner attempts to sort out the James Dolan-Charles Oakley feud. 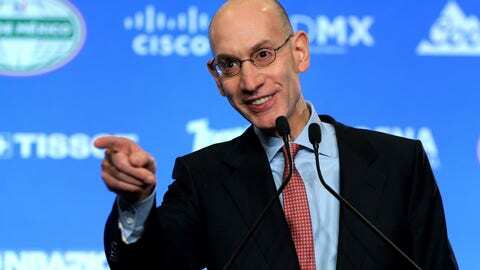 NBA Commissioner Adam Silver has built a reputation for fixing issues that may affect the image of the league in a quick and effective manner and now he’s working to resolve the issues surround the New York Knicks and Charles Oakley. The Donald Sterling scandal leading to his removal as owner of the Los Angeles Clippers and this year’s NBA All-Star game originally planned for Charlotte moved to New Orleans. It’s clear the issues between Oakley and owner James Dolan stem deeper than the recent altercation that led to the 19-year NBA veteran’s arrest last week. Oakley has been critical of the Knicks for years since leaving the franchise after 10 seasons, straining his relationship with Dolan. The Knicks’ owner issuing the Madison Square Garden ban to Oakley after the Feb. 8 arrest has gone on to question Oakley as a safety risk and a possible alcoholic. Silver held the meeting at his office in New York with Oakley, Dolan and a special guest via conference call, Michael Jordan. Jordan is a good friend of Oakley’s, dating back to their early years with the Chicago Bulls and as owner of the Charlotte Hornets, Jordan has a relationship with Dolan. As part of his released statement Silver gave his thoughts on the meeting. Sunday during the Knicks’ upset victory over the favored San Antonio Spurs, Dolan revealed the surprise return to MSG of former Knick Latrell Sprewell after 13 years. Sprewell sat among a variety of alumni that included Larry Johnson, Bernard King and Knick Vin Baker (briefly a Knick) as an obvious publicity stunt. Sprewell had a very similar feud with Dolan after being traded to the Minnesota Timberwolves in 2003. He spoke to reporters during the game regarding his change of heart with the Knicks owner. Fans were happy to see the return of Sprewell to MSG, but many others such as die hard fan Spike Lee continued to protest the Oakley banning. The Knicks organization must find a way to govern themselves correctly without the help from Silver. The meeting to resolve this situation sounded almost too childish for a professional organization to be subjected to making both parties seem even more immature. The only silver lining that may come from this will be the eventual return of Oakley among the Knicks alumni where he definitely belongs. I do believe a message was sent effectively to Dolan that fans opinions and feelings do matter more than just money. The businessman nature of Dolan is great at making money, but it will be the humility and understanding of the fans in New York that will make him a champion owner if done correctly.